The Reliable Waterproof Phone Case. 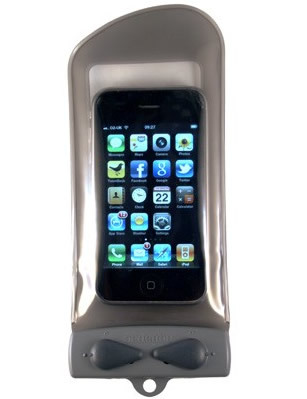 The Aquapac waterproof iPhone case offers guaranteed waterproof protection for all models of iPhone. The Aquapac waterproof phone case has been independently tested by the British Standards Institute to the toughest international waterproofing standards. Aquapac waterproof phone cases have been awarded the Queen's Award for Enterprise in recognition of achievement in continuous innovation and development. 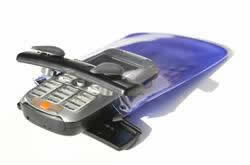 The waterpoof phone case uses the Aquaclip which was awarded Millennium Product Status by the British Design Council. The Aquaclip is great little device which seals the case with a simple twist of a lever. In tests at Bath University the Aquaclip was tested for extensive opening and closing, with no loss of function. Aquapac waterproof phone cases have the markets lowest warranty return rate at 0.05%. Aquapac guarantee if the waterproof case fails they will compensate you for the contents as well as for the case and the warranty lasts for 5 years. ''These are the most reliable waterproof phone cases we have sold in the past few years, with a minimal return rate. No other manufacturer offers a 5 year warranty against defect." With Aquapac you can buy your waterproof phone case with confidence." This Aquapac (108 Mini Whaganui) case can be used with all iPhone models and many small sized phones such as the BlackBerry Pearl, the HTC Desire, the Samsung Galaxy S, and the Motorola Droid. You can operate your waterproof iPhone right through the case. You can make and take calls right through the case material. With most phones it makes no noticeable difference to the volume. And the signal is unaffected. The TPU material won't be broken down or discoloured by sunlight. 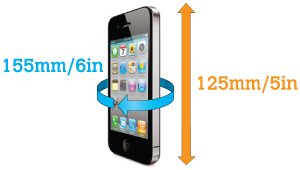 Most phones float in the Aquapac, but a few don't such as the iPhone. Ultra-slim phones like the iPhone should float if you fold up a few pieces of tissue paper and slide them into the case behind the phone. It comes with an adjustable neck cord so you can hang it round your neck. The Aquapac 5-year global warranty against defective workmanship. It's softer and more malleable. Making it even easier to operate your waterproof iPhone controls through the material.